Aqua Pool specializes in inground, gunite pools. The answer to this question is no! Gunite indicates the type of underlying cement and rebar structure of a pool and is synonymous with shotcrete. Plaster is merely one of the interior finishes available for application on top of the durable gunite structure. Do I shut my pool off when I go on vacation? Absolutely not. It is imperative that your pool be allowed to filter itself everyday. It is true, however, that depending on the time of year, you may need to adjust your filtration times based on amount of sunlight, air and water temperatures, and the amount of debris in your pool. If you plan on heading out of town, Aqua Pool offers a Vacation Maintenance Service that can be deployed to take care of all of your pool needs. Can dogs swim in my pool? Of course, your furry friends should be able to enjoy all of the fun a pool brings. Our pools are built for families with pets. We just recommend making sure that your pup knows where the stairs are in order to safely climb out. 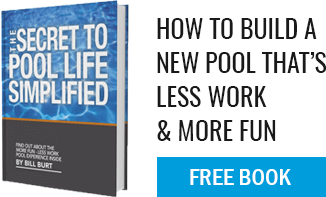 In the age of technology, owning a pool is becoming easier and less time intensive. It is super important that you take care of your pool. And if it is designed properly with the right equipment, the short answer is that it isn’t a whole lot of work at all (just a few minutes per week, honestly) but it does take attention. At Aqua Pool, we offer a Pool Maintenance service that sets you free of your pool care by allowing one of our expert technicians to service your pool for you.